I have been keeping my eye on wireless charging for some time and I see that they all are using inductive coupling. It begs the question; Why? Inductive coupling between tuned circuits has some peculiar properties that may be useful in niche applications but are completely undesirable in wireless power transfer. 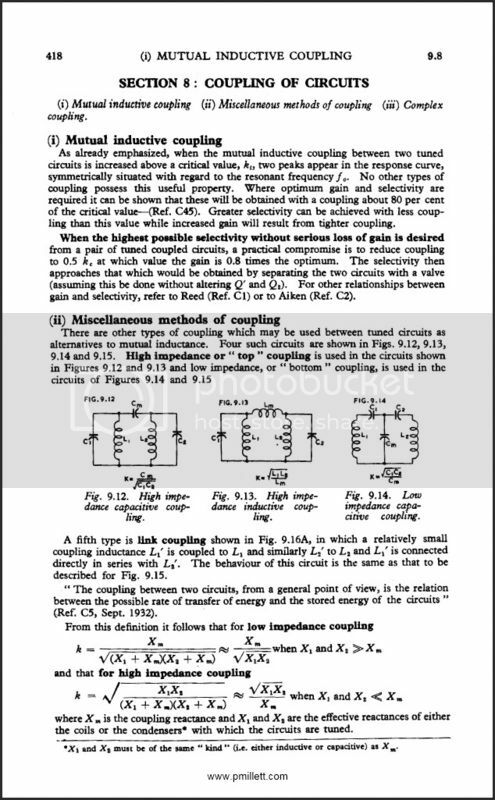 Long ago it was determined that electrical coupling between tuned circuits worked for power transfer. The coupling could be directly through a conductor or it could be through a dielectric, like air. It eliminates the problem of limited power transfer between magnetically coupled tuned circuits. As already emphasized, when the mutual inductive coupling between two tuned circuits is increased above a critical value, kt, two peaks appear in the response curve, symmetrically situated with regard to the resonant frequency f0. No other types of coupling possess this useful property. Well, broadly speaking, any coupling will do. It can be predominantly E, M, or a mix, as long as the combination's phase is constructive. Generally speaking, you can analyze a bandpass filter as a system of resonators connected by a coupling matrix; it doesn't matter whether that coupling is achieved by lumped-equivalent capacitors or inductors (or mutual inductance, or tapped coils, or..). For E to be strong enough, in the near field, very high voltages would be necessary, which makes for problems with safety, RF burns, atmospheric discharge and so on. Whereas the magnetic field has a spacial extent corresponding to the size of the coil, and doesn't cause breakdown or discomfort (higher frequencies do have the effect of 'microwaving' moderately conductive materials, like meat, but that's at higher power levels, too). The E field generators should be at high potentials but that is not a problem if they are well insulated. No current would be allowed to flow out into the environment. Much like capacitive touch sensors generate E fields with no adverse effects, RF burns and atmospheric discharge dangers can be completely eliminated. Again, the problem of the two coupled circuits pushing each other off frequency completely disappears with E field coupling. That allows the maximum amount of energy to be transferred. 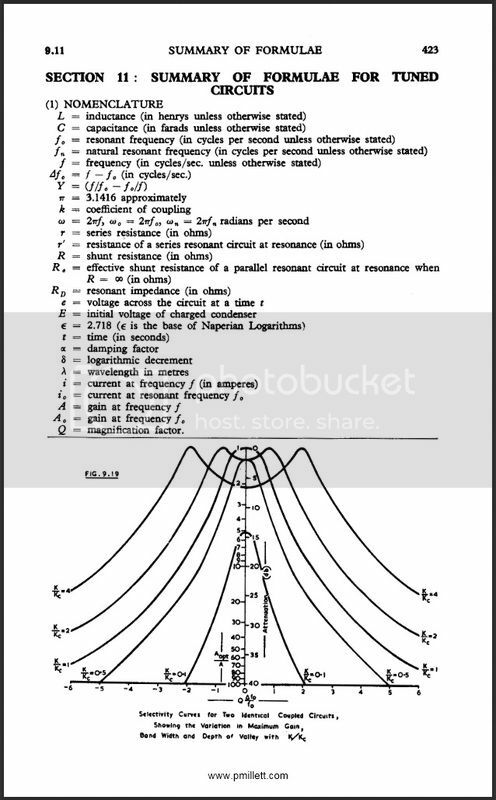 By the way T3sl4co1l, this phenomena can be seen in Tesla coil design. The magnetic coupling between the primary and secondary is usually between 0.1-0.2 k or the device will not work. But, an extra coil can be connected, by a wire, to the top of secondary coil. That is a coupling coefficient of 1, yet the extra coil can resonate freely. That section of the classic Radiotron handbook refers to coupled double-tuned circuits. If only one side is tuned, the tuning can eliminate the leakage inductance and give efficient coupling to the load. If they are not both tuned circuits then the distance between the two coils must be decreased to achieve equivalent transfer. The distance between the two coils changes the leakage inductance in the circuit. "Link coupling" can tune out that inductance (but that is a second tuning). This was done traditionally in RF power amplifiers. In that case, the loading on one of the two tuned circuits reduces its Q. The requirement for critical coupling is on the product of k x (Q1 x Q2)^(1/2), if I remember correctly. Coupled tuned circuits are fun to play with. The reference cited shows the response as one changes the coupling from weak to critical to strong coupling. I once had two tuned circuits (with large volume coils) set up on a workbench. Each had a variable capacitor for tuning, and the coupling was well above critical. The "left" circuit was driven from the tracking generator on a spectrum analyzer, and the "right" circuit was connected through a divider to the spectrum analyzer input. I started with the left circuit tuned to a frequency below that of the right circuit. The analyzer showed two separated peaks at the two frequencies. As I tuned the left circuit to higher frequency, that peak moved to higher frequency, but, before it reached the frequency of the right circuit, the "right" peak started to move to higher frequency and the left peak "stalled" before reaching the right peak. At no point, in that experiment, was there a single peak. I had run into this phenomenon earlier in a physics course about atomic scattering. There, it is called "avoided crossing" of energy levels. That is amazing. So did the right peak ever switch over to the lower frequency? Would the right just diminish the farther it was pushed? How did that work? The peak positions behave very much the same (I don't know if exactly so, but at least analogously so) as pole splitting in a feedback control system: you start with a second order system with, say, overdamped poles; as you turn up the gain, the poles merge (reaching a critical point where they equal), then split again, but along a different angle on the complex plane. The difference is, you're measuring pairs of complex poles at different frequencies and magnitudes. And the trajectories follow a different path, because there are more poles and a different parameter. The "left" and "right" peaks are defined by the tuning capacitor that affects each when they are far apart. As the left tuning continued, the right kept moving, but its intensity did diminish. The two peaks are seen on a single response on the (scalar) spectrum analyzer. This is an easy demonstration if you have a scanned-frequency spectrum analyzer. Then I remember; As complicated as the interactions of those two coils and their fields get, all of that mess disappears when they are coupled in any way other than magnetically. In my demonstration, I applied AC to the "left" coil and coupled the "right" coil to the spectrum analyzer input. The coupling was mainly magnetic between the two circuits.